To a DB, it treats the keys and values as strings, but you probably want structured contents. One way to do this is to use a TensorProtos protocol buffer: it essentially wraps Tensors, aka multi-dimensional arrays, together with the tensor data type and shape information. 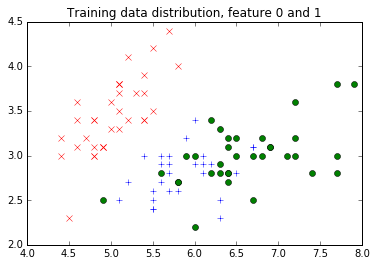 Then, one can use the TensorProtosDBInput operator to load the data into an SGD training fashion. Here, we will show you one example of how to create your own dataset. To this end, we will use the UCI Iris dataset - which was a very popular classical dataset for classifying Iris flowers. It contains 4 real-valued features representing the dimensions of the flower, and classifies things into 3 types of Iris flowers. The dataset can be downloaded here. # First let's import a few things needed. import urllib2 # for downloading the dataset from the web. If you are using homebrew leveldb on a Mac OS, you might see an error warning you that malloc_zone_unregister() failed. This is not a caffe2 issue but is due to the homebrew leveldb having an incompatible memory allocator. It does not affect usage. # load the features to a feature matrix. Before we do training, one thing that is often beneficial is to separate the dataset into training and testing. In this case, let’s randomly shuffle the data, use the first 100 data points to do training, and the remaining 50 to do testing. For more sophisticated approaches, you can use e.g. 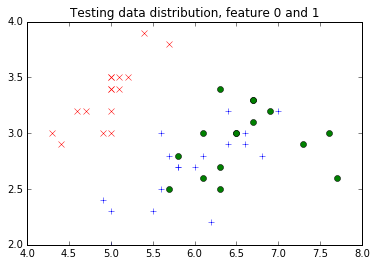 cross validation to separate your dataset into multiple training and testing splits. Read more about cross validation here. # Let's plot the first two features together with the label. # because one should not peek into the testing data. Now, as promised, let’s put things into a Caffe2 DB. In this DB, what would happen is that we will use “train_xxx” as the key, and use a TensorProtos object to store two tensors for each data point: one as the feature and one as the label. We will use Caffe2 python’s DB interface to do so. # First, let's see how one can construct a TensorProtos protocol buffer from numpy arrays. # Now, actually write the db. # Close the transaction, and then close the db. Now, let’s create a very simple network that only consists of one single TensorProtosDBInput operator, to showcase how we load data from the DB that we created. For training, you might want to do something more complex: creating a network, train it, get the model, and run the prediction service. To this end you can look at the MNIST tutorial for details. # Let's run it to get batches of features.